The shuttle Endeavour docked with the International Space Station early Wednesday after a picture-perfect rendezvous that included spectacular views of the shuttle against the blue-and-white backdrop of Earth. With shuttle commander George Zamka flying Endeavour from the aft flight deck, the docking systems engaged on time at 12:06 a.m. EST as the two spacecraft sailed 215 miles above the Atlantic Ocean west of Portugal at five miles per second. "Station and Houston, capture confirmed," shuttle pilot Terry Virts called out. 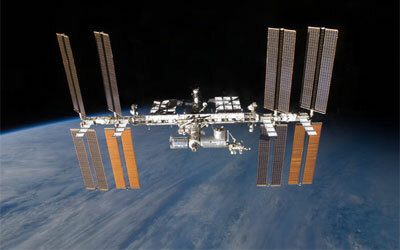 Going into this mission, the space station's mass was 764,350 pounds. With the addition of Endeavour and its cargo - the 15-ton Tranquility module, a multi-window cupola and other equipment - the combined mass of both spacecraft exceeded 1 million pounds for the first time. It took longer than usual for relative motion to damp out between the two spacecraft but by 12:50 a.m., the docking systems were aligned and stable and the vehicles were pulled firmly together. It took another hour and a half or so to carry out leak checks and confirm a tight seal. After that, hatches were opened and station commander Jeffrey Williams and his crewmates - T.J. Creamer, Soichi Noguchi, Oleg Kotov and Max Suraev - welcomed the shuttle astronauts aboard around 2:15 a.m.
"We just wanted to take a moment to welcome the crew of STS-130 aboard the ISS," Williams said. "We're happy to see our friends. Some of us are really happy because we haven't seen many people other than the crew for a long time. And happy that we're coming close to the completion of assembly of station with this mission. So really happy to have you guys on board." "Jeff, we are glad to be here," Zamka replied. "It was absolutely beautiful coming on up. We're ready to bring up Tranquility and cupola and work with you guys and bring it to life. This is a great day." Lead shuttle Flight Director Kwatsi Alibaruho said the rendezvous and docking went smoothly despite problems with a trajectory control system laser range finder. "We had an excellent day on orbit today and a very clean rendezvous and docking," he said. "The only issues we were tracking were associated with the trajectory control system. It's basically a laser range system that provides us range and range-rate data between the space shuttle and the space station that helps the commander navigate as he's flying the final approach. "That system started providing some erratic data when we were at about 200 feet away from the space station. It wasn't a problem at all because this really is one of several tools that we have. ... We just relied more heavily on the hand-held laser and disregarded some of the noisy data that was coming from the trajectory control system." Before docking, when Endeavour was positioned 600 feet directly below the space station, Zamka monitored a computer-assisted back flip maneuver that exposed heat shield tiles on the belly of the shuttle to powerful cameras operated by Williams and Kotov. The rendezvous pitch maneuver is part of a post-Columbia suite of techniques to help engineers assess the health of the shuttle's heat shield. The digital images shot during the rendezvous pitch maneuver were downlinked right away and Alibaruho said no obvious problems were immediately apparent. The team will know by the end of the day Wednesday whether any additional inspections are required. "Really, by close of business this day, we should have a very good sense of whether or not we have any outstanding concerns or whether we're well on the path to the thermal protection system being cleared for entry," he said. "If we get past these meetings we have today with no requirements for focused inspection and no significant concerns ... it's very, very high likelihood the TPS (thermal protection system) will be cleared for entry in due course."